originally created by Dave Strong Welcome to the Virginia Highway Project! This website is a joint venture between "Froggie" and "Mapmikey" and details the routes and highways of Virginia, and began as a combining of Mapmikey's Virginia Highway's site and Froggie's Virginia Highway Ends photo site. Additional material related to Virginia will be offered as time allows. Updates (1/8/17): New routes documented for the first time: US 220 ALT #1 and VA 287 #1; New route log available (1951); VA 281-300 page broken into indivdual pages with more mapscans and info, especially routes 284-287; historic pics on VA 297 and 297 Bus pages; more info on the eastern end of US 60 and northern end of US 501; mapscan found for the Richmond VA 88; VA 164 was extended. Updates (3/17/15): Updates to the following entires: Numerous edits have been made (too many to summarize - go here to see the full list. New routes are documented for the first time: I-864, US 11Y #1, US 29 ALT #5, US 360 ALT #4, US 460 Bus (Grundy), VA 9Y, VA 10A, VA 13Y #1, VA 23 TEMP, VA 25Y, VA 27 ALT, VA 31Y, VA 33Y #1, VA 42Y, VA 109Y, VA 254 ALT, VA 284 #1, VA 323 TEMP, VA 336 #3, VA 337 ALT #2, VA 406 #2, VA 408 #2, VA 410 #2, VA 411 #2, VA 412 #2, and VA 464 These entries were substantially updated: VA 143, VA 238, VA 307, VA 411, VA 441, VA 530/530Y. A new superpage has been created for route-log/VA 337. A new US 33-VA 33 transition gallery has been written. Updates (1/10/15): Updates to the following entires: The I-64, I-66, I-73 , I-77, I-81, I-85 and I-95 pages have been revamped with a lot more detail and mapscans. All 3di routes were given their own pages and also updated. 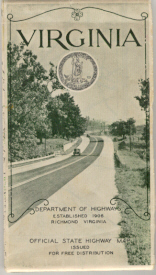 A new superpage has been created for Shirley Highway, VA 350. Route logs have been added for 1935, 1941, 1949, 1957, 1979, 1999, and 2001. A new photo gallery is available of 1960s scenes around the I-495 beltway. Updates (11/27/14): Updates to the following entires: The US 25E , US 48, US 220 , US 240, and US 340 pages have been revamped with a lot more detail and mapscans. 1 new route is documented - VA 281. Additionally, VA 172 and VA 280 have been extended. Questions, Comments, or Corrections? Contact us at the e-mail addresses at the bottom of this page. Want something else road related? Gribblenation - Material from much of the eastern U.S. The compilation of this material is original. Scanned maps are copyrighted by their publishers. This site uses small portions of these maps for research and educational purposes, which constitute fair uses. All other images (including photographs) were created by the authors unless otherwise specified. Do not present any of the information here on another Web site without first receiving permission from the author. The maps constitute the property of the Department of Transportation and/or other agencies of the Commonwealth. They are proprietary and protected by copyright or other intellectual property laws. The Department expressly prohibits the copying of protected materials, other than for individual private use., without the Departmentï¿½s prior written permission In no event shall the maps be sold or used for promotional, commercial or political purposes. Permission from the Department for any other use shall be granted or denied, in the Departmentï¿½s sole discretion. The Department provides the maps as a public service for informational purposes. However, the Department makes no claims as to the accuracy, currency or completeness of the information provided. In no event shall the Department be liable for any errors or omissions with respect to such information. Users are solely responsible for compliance with the copyright and intellectual property laws with respect to use of any information gained from this site. These are personal web pages and are not connected to the Virginia Department of Transportation or the Commonwealth of Virginia in any way. To get to the official VDOT web page, click here.